Here are a couple more blocks my kidlets made for The Primary Bee. 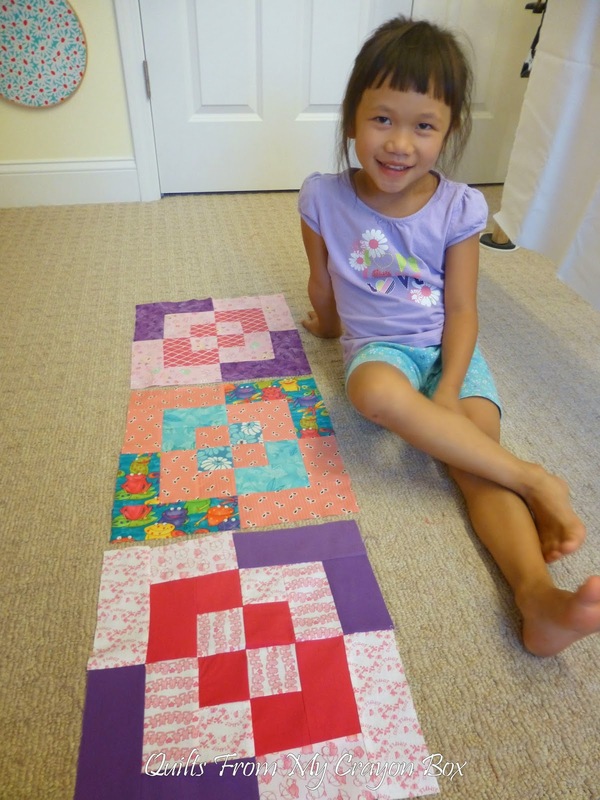 The August Bee Princess was Amelia who's mom Pippa blogs over at Pippa's Patch. 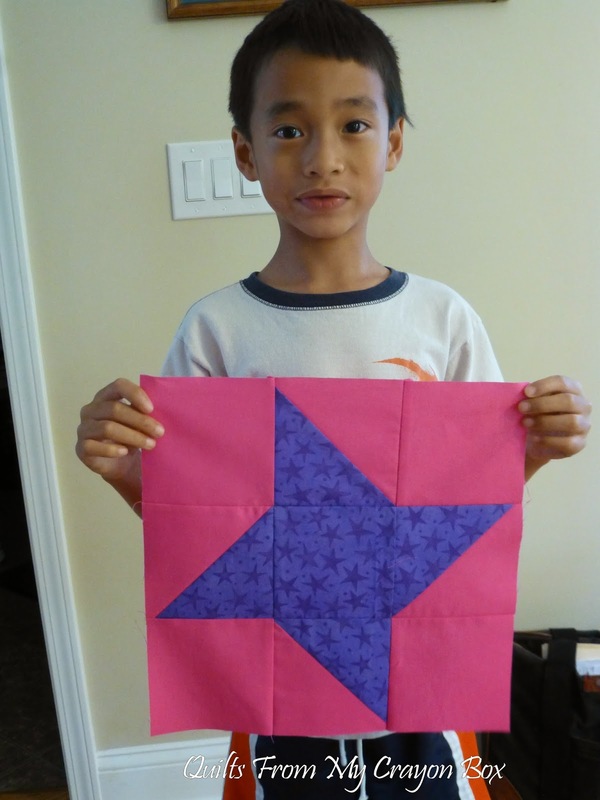 She requested a Friendship Star block in Hot Pink and Bright Purple. As is usual, when I asked if they wanted to sew, Sunshine was rearing to go. 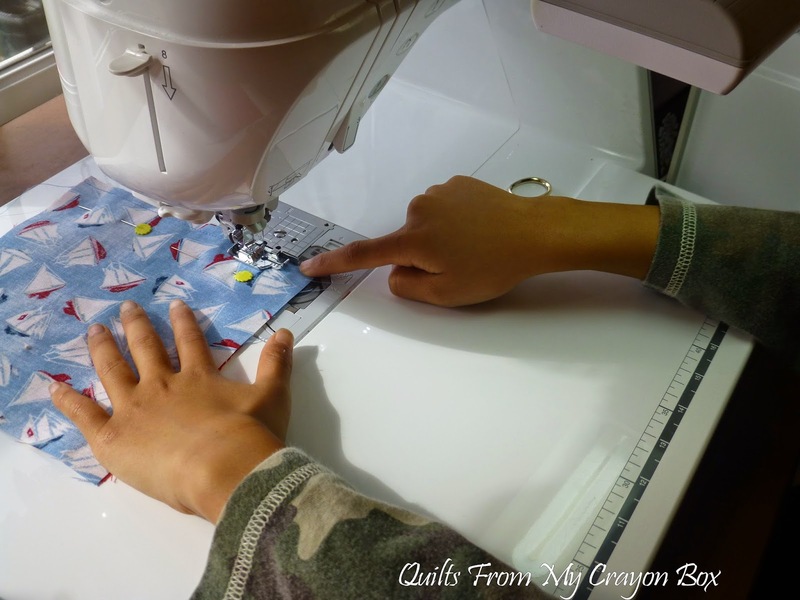 Here she is sewing the HST pieces together. I have to chuckle each time with how serious she gets when she is cutting apart the pieces. Here is the finished block. She was obviously proud of this one. 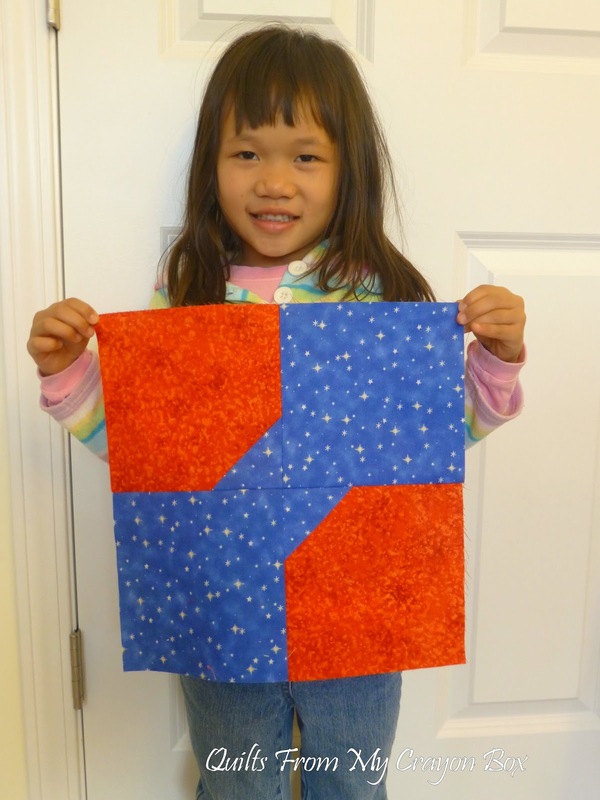 She also received 3 more Bento Box blocks for her own quilt and wanted me to take a picture of her with them. 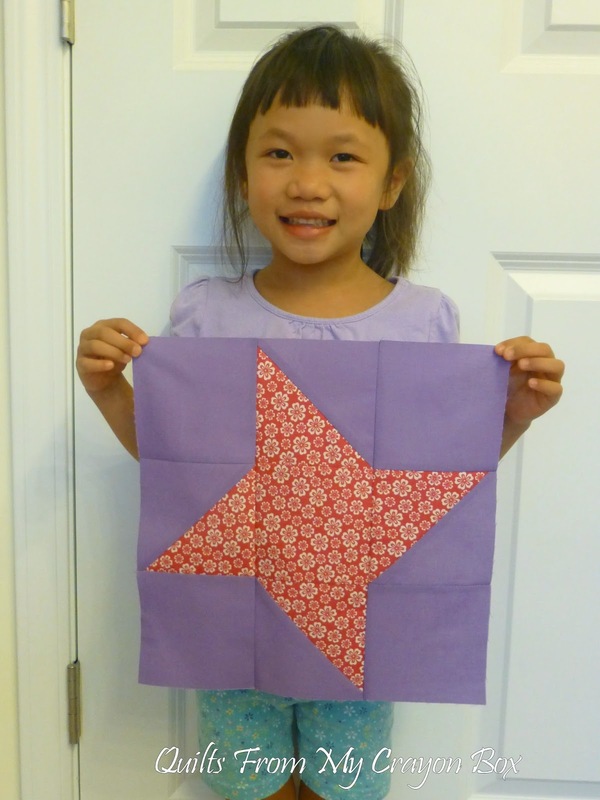 While she does like the fun fabrics used on the middle one, she is a bit confused as to why it isn't Purple and she is now considering whether she wants to keep it on the front of her quilt or so something else with it like add it to the back. Second up was Jammer and as you can tell by his expression, he wasn't all cheery this day but he got the job done and off they went. Then it was time for the September blocks which were for Thomas. 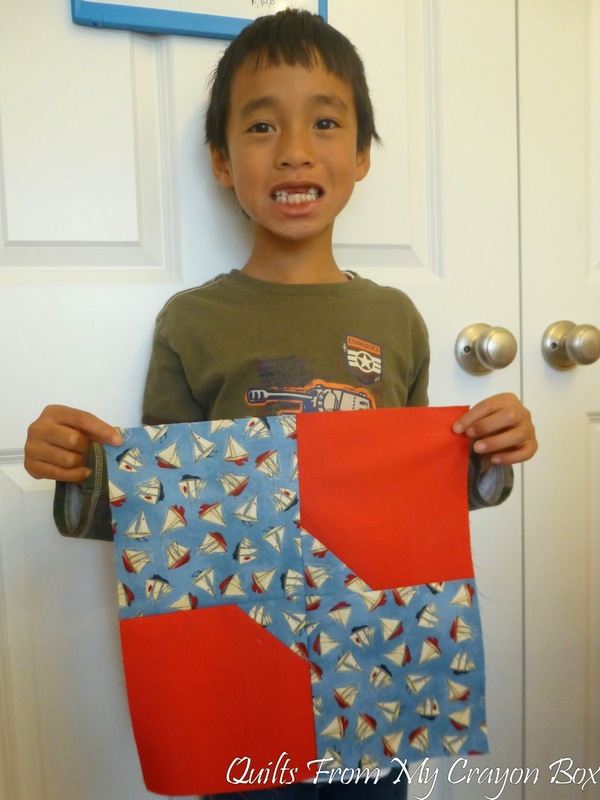 He requested Bow Tie Blocks in Red and Blue. 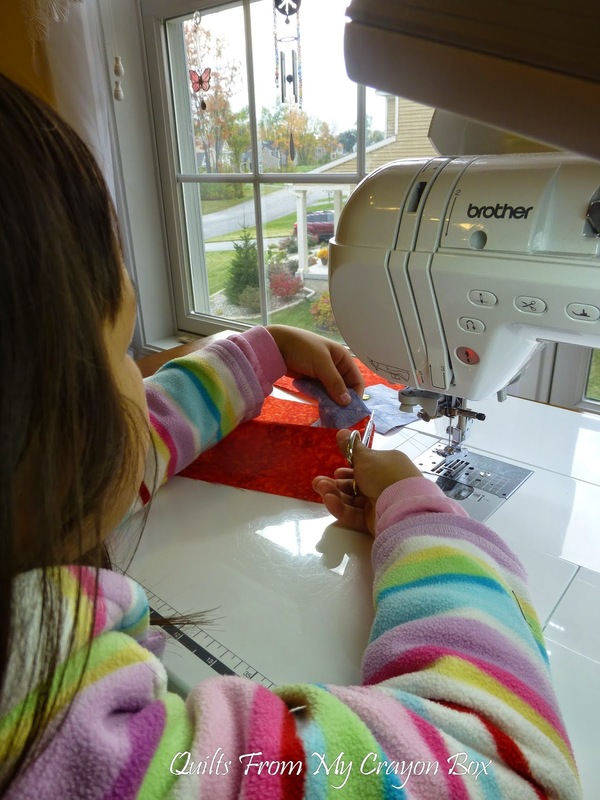 After pulling and cutting the appropriate fabrics for them, the kidlets got working. Sunshine was of course the first to try her hand at it. And the completed block. She loved that this one was so easy to make. I just had to show you one of the outtakes. She was full of giggles. Jammer was actually eager to try this easy block himself. He's getting so much better at guiding the fabric and he works the pedal totally himself though I do turn the speed down to the lowest setting possible. 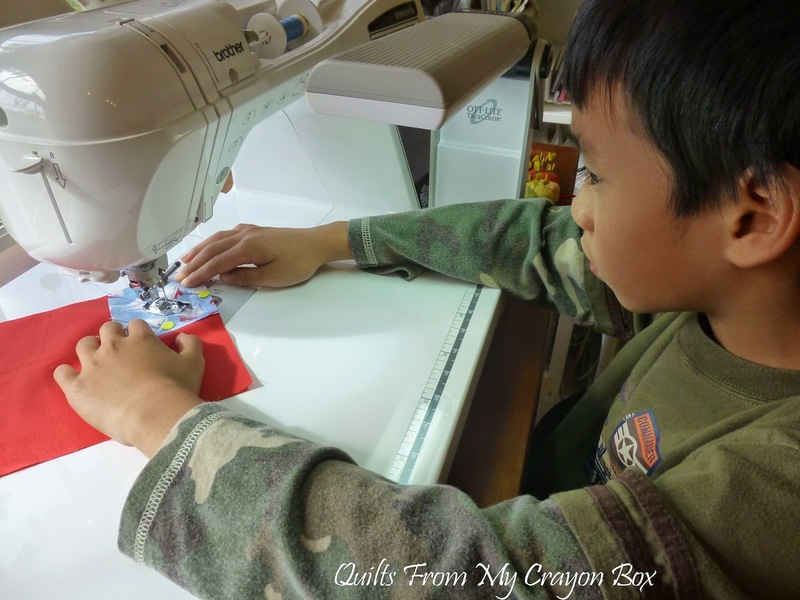 I'm trying to teach him why it is so important to guide the fabric properly and sew an accurate seam allowance. 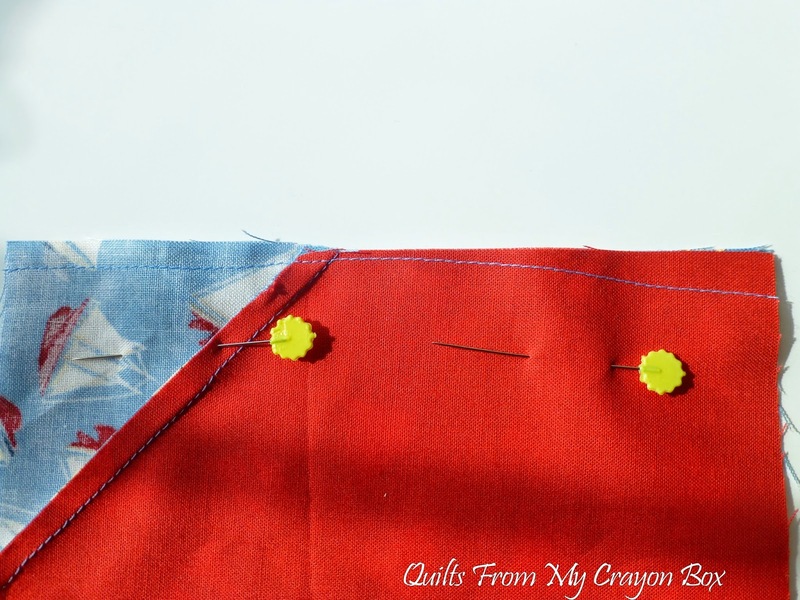 He didn't quite get it when I showed him this seam line but when I opened up the pieces and he saw how they didn't go together nicely, he understood better and didn't grumble too much when I made him redo it. The rest of the seam lines were better and he at least gave me this 3 missing teeth smile at the end. Jammer is the Bee Prince for October so his blocks should start arriving soon. 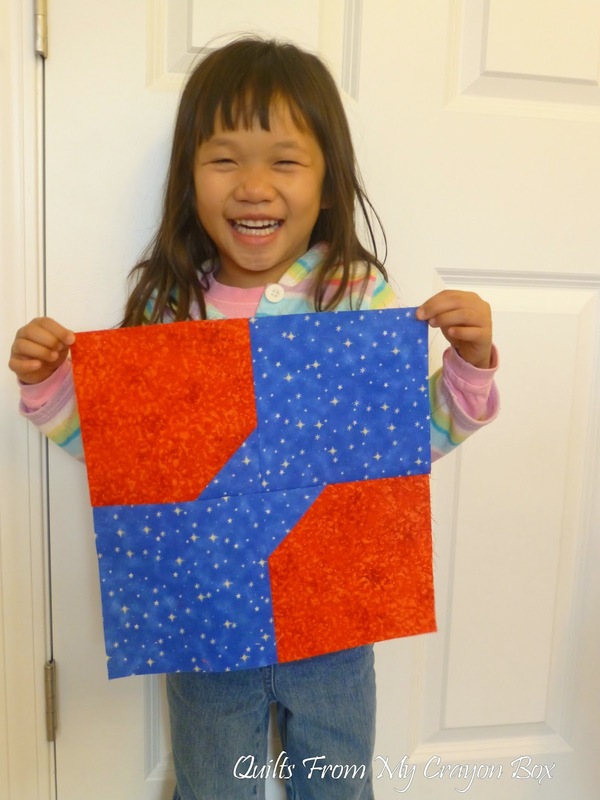 Both kids also need to make the blocks for each others' quilt so those are the ones that we'll be working on next. 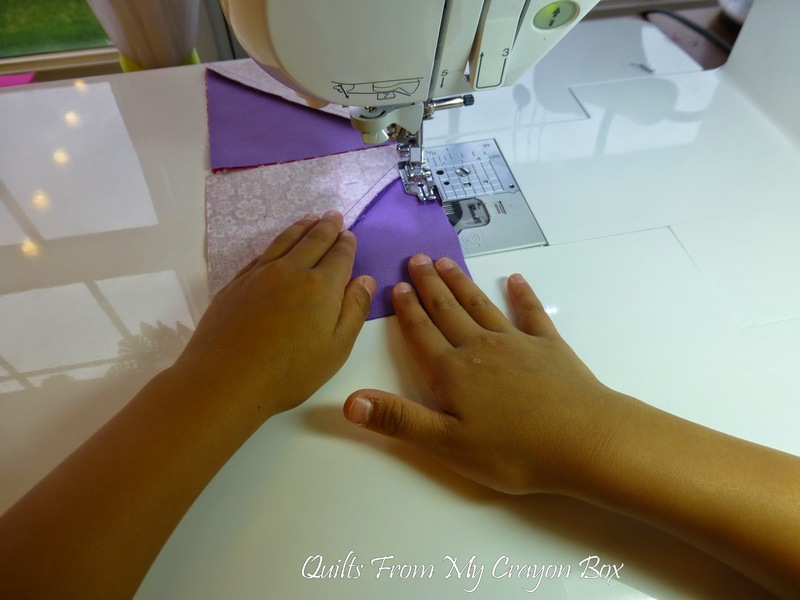 Giggles and toothless - what a great sewing pair! 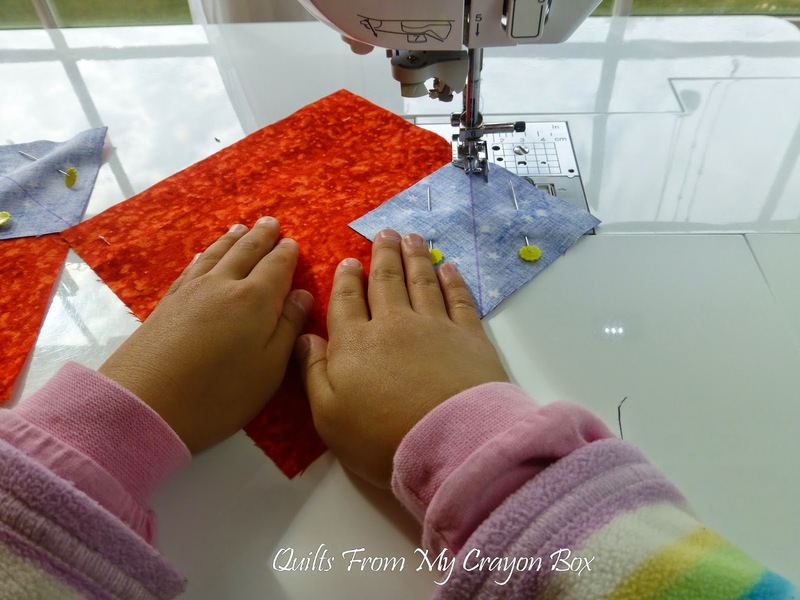 I love seeing your kids working on these blocks....future quilters, for sure. Great smiles! Such happy kids and sweet smiles! 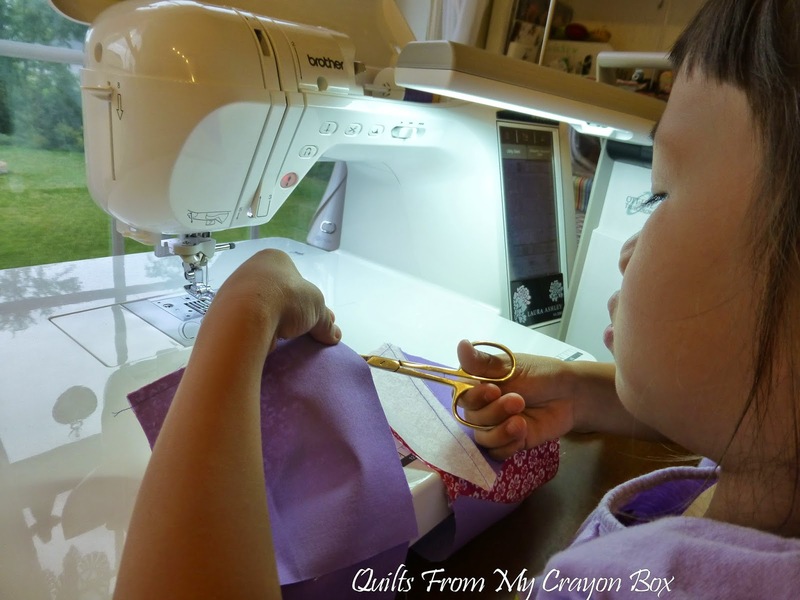 It's so fun to see those little ones sew! what talented children! love their color choices. Adorable! they did such a great job.